Some of our generous sponsors, supporters and donors. Maggie's Mission is proud of the work we do and even prouder of the organizations and people who support us. We thank each and every one one of you for helping us raise awareness of pediatric cancers, fund research and provide help to families and children affected. Maggie first meets the band in February 2017 at Madison Square Garden. 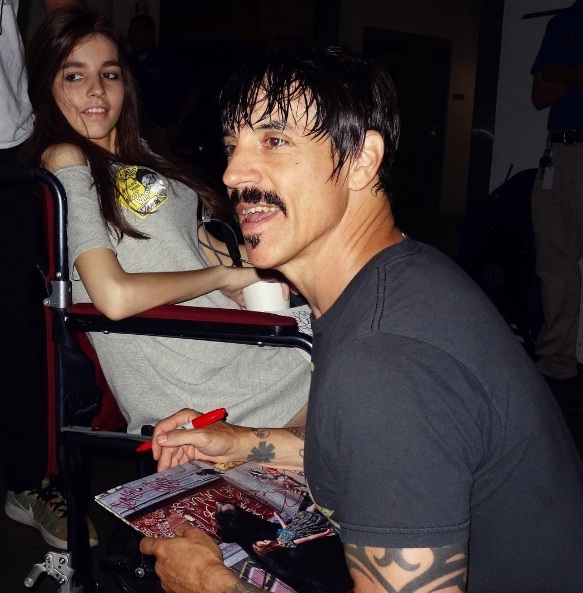 Anthony Kiedis with Maggie at their Tampa, Florida concert after she was diagnosed as terminally ill. Anthony was signing a Getaway album Maggie had bought for one of her favorite teachers Dan Barrett. Maggie with Josh at their Miami, Florida concert. Josh was and still is an angel to Maggie and to our family. We’d like to say a very special thank you to The Red Hot Chili Peppers who befriended Maggie when she attended their “Getaway Tour” concert at Madison Square Garden in February 2017 while she was very sick and undergoing treatment. After the concert, in a chance meeting backstage, the entire band tuned into Maggie and welcomed her - asking what her favorite album and song was. They invited her to the next night’s concert but she couldn’t make it, so they chose to honor Maggie by playing and dedicating the song “Don’t Forget Me” to her. You can listen to that song here: https://www.youtube.com/watch?v=r5d-NP2wDWw - the ending got cut off but Anthony Kiedis yelled “This song is for Maggie Schmidt. For Always!” Maggie would ask us what they meant by the words “For Always” but we didn’t know. We now use part of their lyrics and words as some of the language for the Foundation. Band member Josh Klinghoffer sought out Maggie’s contact info and told her it was an honour to meet her and invited her to any concert she could attend on their tour. We were blown away by their kindness and sincerity to our daughter. It made an awful situation a bit lighter and brighter for all of us by having their love and support. She did get to attend two additional concerts in Florida but it was after she had been diagnosed as terminally ill. By the time the chosen dates rolled around in April, we were not even sure if Maggie could physically make it but make it she did. She was strong like that and extremely determined. In addition to the friendship and peace the band offered to Maggie and to us by allowing our family to become a small part of their world during the most difficult time in our lives, they also donated a substantial amount of money to our fledgling Foundation and collectively helped us raise a whopping $60,000! We will be forever grateful for their understanding, compassion and acts of pure kindness and selflessness towards Maggie and our family. We know it helped her through the unimaginable and us as well. We consider all of them our angels, particularly Josh Klinghoffer.